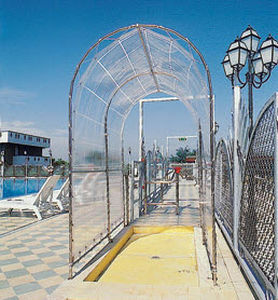 The prefabricated shower tunnel is ideal for entrances to swimming-pools. Its framework is made of tubes in 15/10mm-thick AISI 304 stainless steel (dia 22 mm) with cover in white PVC canvas. The tunnel can be provided either with one (TUND 01) or two inside arches (TUND 02) having 5 vaporising sprayers each. Water supplied to the arches must be premixed and during planning the water flow of each single sprayer (60 l/min TUND 01 and 30 l/min TUND 02) has to be taken into account. According to the project, tunnels mod. TUND 01 and TUND 02 can be operated by electronic barrier controls mod. D505, D506 or . To ensure perfect functioning, the water supply of premixed water is to be carried out through a circulating pump.